But because this section doesn't live only of new creations, I decided to bring up today one model with some time, that some should have seen already highlighted in other famous LEGO blogs months ago. 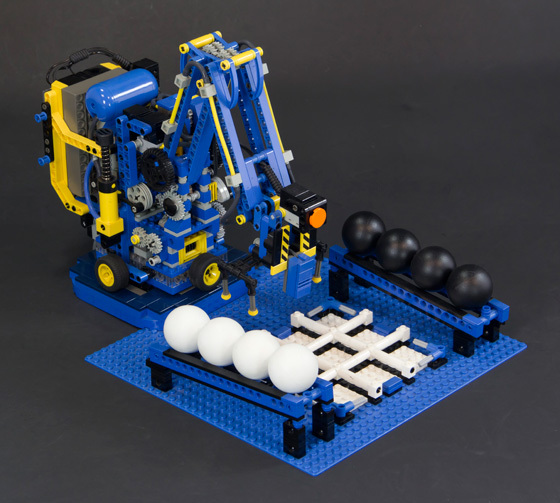 A LEGO Tic Tac Toe play robot, using one single RCX, made by Arthur Sacek back in 2004 and later relived in a YouTube video by its author, at the middle of past year. The utilization of the RCX with a compressor and other pneumatic elements, makes it even more interesting. You can find additional photos from this robot, at Arthur's website. Fantastic! I always thought that the old LEGO Mindstorms allowed for way more compact robots than the inexplicably bulky NXT parts... For some reason, the old RCX feels "more technic" to me. I like this model too and it encourages me to do something with the RCX again. Though I agree the RCX and it's smaller sensors have some advantages over the NXT. A huge one is the possibility to stack the sensors.